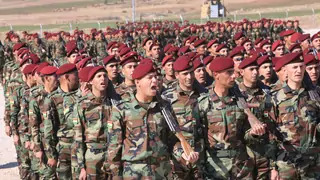 Kurds have become critical players amid domestic upheaval and political changes throughout the Middle East. Explore the history of the Kurdish people and why some Kurds may be on the verge of achieving their century-old quest for independence. Iraq continues to bedevil American foreign policy, and the world. Now the Kurds will vote on their own state. The world reacts to U.S. President Donald J. Trump's speech at the United Nations, Germany holds national elections, and Iraqi Kurdistan holds a referendum on independence. "How Happy Is the One Who Says, I Am a Turk!" The war between the military and Kurdish insurgents is really a conflict over what it means to be a citizen of Turkey. That’s why there’s no end in sight to the bloodshed. Not quiet on the Kurdish front. The myriad alliances and rivalries between Turkey, the United States, and the Kurds of Iraq, Syria, and Turkey are complicating U.S.-Turkish foreign policy in the Middle East. Upheaval in the Middle East presents both challenges and opportunities for the 30 million Kurds living in the region. The newest InfoGuide outlines these dynamics, their historical underpinnings, and how they could reshape the Middle East.